Anyone who thinks fishing is all about sitting on the bank of a quiet stream watching a bobber float on the water has never actually been fishing. A pastime that requires a huge box to carry the essential gear is a truly complex undertaking. The knives of the trade are also varied — when we speak of fishing knives, we’re not talking about one type that’s just right. Fishing requires several, each suited to a particular task. You may need to cut rope, and quickly, if you fish from a boat. Floods used to rise gradually when nature ran the show, but downstream from Corps of Engineers dams you may not have time to untie from that handy snag before it pulls the bow under. A good belt knife like the RAT Cutlery Case RC-3 Bushcraft solves unexpected problems quickly and also does the nasty work like cutting bait. Don’t use the same knife to clean the fish, unless you’d eat the bait yourself. Things are always going wrong with rods and reels and outboard motors, and if you don’t have tools for the repair, you just go home. Long nose pliers are also needed if you catch and release fish — barbed hooks don’t just let go. While multi-tools such as the Leatherman Surge offer a variety of tool bits handy for working on tackle and tweaking reels, the jaws are a little short for retrieving hooks set deep in a fish’s maw. 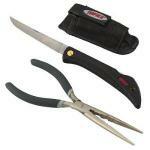 For more precise fish-handling consider the Rapala Pro Set of long-nosed pliers and folding filet knife. For cleaning both large and small fish, get a good filet knife. The most economical use of the fish often turns out to be a neatly cut filet. 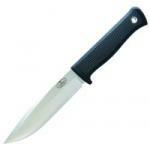 A knife that’s too stiff, too small, or too short wastes a lot of fish. For the larger catch you’ll need a full sized flexible blade like our choice for the best fillet knife — Queen Cutlery’s Fishing and Filet Knife. 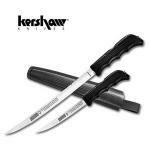 Many freshwater fishermen will find this 7-inch Fillet Knife from Kershaw to be all the knife they need. Take good care of it, and you'll have money left for other important gear. 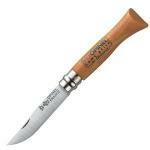 Made for cleaning larger fish, the Berkley Breaking Knife includes an advanced blade coating to extend blade life. Eight multi-purpose blades give the Alinghi Yachtsman a total of 17 functions. This sensible assortment of strong tools makes the Alinghi an excellent multi-tool for anyone who works with rope, rigging and machinery. 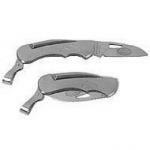 The Havalon Baracuta-Edge is a great idea and a good knife, but five inches of replaceable high carbon stainless steel blade comes at a higher cost than the smaller Havalon Piranta system. You might want to keep that whetstone handy and recycle blades instead of throwing them out. The Berkley Extreme Duty Knife puts together nearly every high-tech good idea available to manufacturers of rugged fixed blades. The result is a little strange in appearance, but everything about the knife works. The Benchmade Barrage adds powerful spring-assisted opening to the already solid construction of Benchmade's Axis-lock knives. The Valox grip also has some excellent features, but doesn't beat Zytel in wet weather. 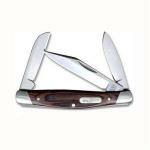 Made in Olean, New York, the KA-Fillet Fishing Knife requires minimal care. 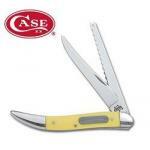 Built for the roughest working conditions, the knife is strong enough for tougher jobs than filleting fish. Rapala's Soft Grip Fillet series knives feature flexible blades of high carbon European stainless steel and come with a handy pocket sharpening system. If you want a really good edge, you'll still need a whetstone. Rapala's Deluxe Cordless Fillet Knife lets you work anywhere without a power cord to get in your way. The fast recharge time and convenient charging station give this fillet set plenty of backup power for those days when you've caught your limit. 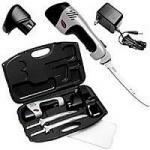 Interchangeable blades and an extra-long power cord add to the convenience of this handy electric fillet knife. Built with the outdoorsman in mind, the Rapala 110VAC knife will be handy in the kitchen as well as the backyard. This upgrade of the Leatherman Ukiah design replaces the Ukiah's glass-filled nylon handle construction with stronger components of machined aluminum and inlays of tropical rosewood. Even the steel takes a step up in quality to S30V high carbon stainless steel. 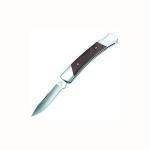 Since 1984, Myerchin has made modern rigging knives for the modern professional sailor. The Myerchin A200P is one of the strongest Myerchin professional models, carried by sailors aboard hi-tech yachts, Coast Guardsmen aboard rescue and patrol boats, and even crewmen working the decks of river tugboats. At the end of the fishing day when you're tired, it's time to clean the fish. If you'd rather not struggle with poor tools, a good fillet knife like the Wusthof 4622 Classic 7-inch fillet knife makes the last chore of the day go quickly. It's rare to find a Swiss Army knife with locking blades. 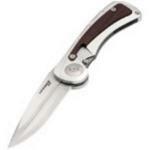 In fact, only three of Victorinox's pocketknives feature locking mechanisms... and the Trekker is one of them. Nothing like taking an industry standard and making it bigger & better, right? 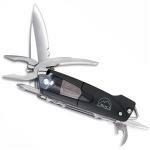 That's what Leatherman has done with its Surge pocket multitool. Apparently, the press agrees. Back in 2006, Field & Stream Magazine awarded the Surge the title of "Best of the Test" for multi-tools for hunting and fishing. 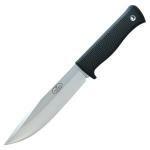 The craftsmen behind Boker bring you the knife you see here; a blade that's fairly cheaply made, but is still handy to have as an all-around tool knife. 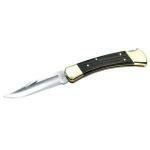 This small knife is a stylish and sturdy choice for an everyday carry. When folded, it's only 4.25 inches long. The blade itself is made from 440 stainless steel. It may not be the highest quality steel available, but it gets the job done and is made to be withstand minor abuses. 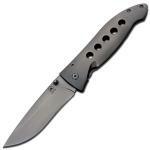 The S1 is another great knife from Fallkniven. 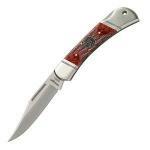 Fallkniven is a small family-run operation known for producing a short list of exceptional knives. 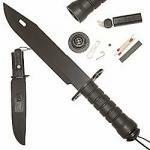 The S1 is a "forest" knife, though it might be better known as part of the bushcraft, survival, or wilderness categories. Spyderco makes cool looking knives that often break ground in terms of functionality and materials. The Pacific Salt actually looks pretty tame compared to other Spyderco Knives. Compare it to the Spyderco S, for example. However, the Pacific Salt has something that very few other knives have these days: H-1 Steel. Not that many Swiss Army knives are available in black as well as red. The Swiss Champ is one of Victorinox's most popular models and is also one of the most sought-after black ones. 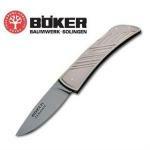 Tracing Boker's lineage is a bit like tracing down a family tree. 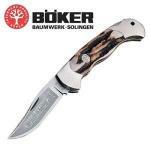 The current Boker knife making company has been at it for just over twenty years. And yet their lineage traces back another two hundred years before that! Fire up the barbie and let's grill us some bass! Right after we clean those suckers up, of course. 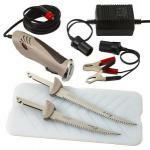 Luckily we've got this electric fillet knife set from Rapala. It will surely do the trick. 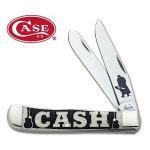 What with its interchangeable 6 and 7.5 inch stainless steel blades. If you're a seafood lover, chances are at some point you're going to want to cook up some oysters of your own, because eating out can get really expensive. Gotta hand it to the Swedes - they sure do know how to make a great survival knife. Fallkniven is a supplier of knives to the king of Sweden, so they're probably doing something right.